Walk up the hill from Piazza delle Erbe to La Rocca di Montestaffoli, the ruins of the 14th century fortress above the town. Lovely olive groves provide a bit of shade from the sun and a great place to enjoy salami on a baguette while taking in the views of the rolling Tuscan hills and the towers rising from the town center. Roving musicians like the harpist pluck out classical tunes while artists set up their easels and paint. In summer, there is an outdoor cinema and you can learn more about Tuscany’s best known white wines at the Museo del Vino (Wine Museum). Museo del Vino: open April to October Thursdays – Mondays 11am to 7pm and Wednesdays 3pm – 7pm. Admission is free and wine tasting is available for a small charge. Torre Gross, the tallest tower at 54 meters (177 feet) in height and dating from 1298, is the only tower open to the public. Climb to the top for views over the picturesque countryside. Admission is €5 and is included with the combo ticket for the Museo Civico. When you think of Tuscany, you probably think of Chianti. But the vineyards around San Gimignano produce the white wine grape Vernaccia, so famous it was even mentioned in Dante’s Inferno. Vernaccia di San Gimignano is a crisp white wine with citrus fruit flavors. Enotecas dot the medieval streets and you can even get a plastic glass to go, which you can take to one of the many panorama viewpoints to enjoy while gazing over the stone Tuscan farm houses and rolling green hills. The world-famous Gelateria di Piazza is right in the center of Piazza della Cisterna and has a variety of creative flavors like saffron or pink grapefruit with sparkling wine. You’ll easily recognize it because there is always a line out the door. Shops and boutiques built right into the stone walls line the alleys of San Gimignano. You’ll find specialty food, wine, leather, and ceramic shops. Fine Italian leather can be found for much less than in nearby Volterra or Florence. Window shopping might tempt you to make a purchase and come home with two new leather bags like I did. Gourmet shops all throughout San Gimignano sell local wild boar sausage. It even comes with red wine, truffles, fennel, or pine seeds and is thinly sliced and served on a crusty baguette drizzled with olive oil. Grab a salami baguette and a bottle of Vernaccia and head up to La Rocca for a picnic lunch. Agriturismo Taverna di Bibbiano looks directly at San Gimignano with outdoor tables on the edge of a hillside planted with a lavender field. There’s hardly a more romantic spot to sip on wine and have dinner while watching the sun set over the towers. The menu changes regularly based upon what ingredients are in season as everything comes fresh from the farm. We dined on a pear salad drizzled with balsamic glaze and Tuscan meatballs in a Chianti sauce accompanied by grilled, stuffed tomatoes. We sipped a bottle of Chianti as we watched the sun slowly dip behind the hills. A warm chocolate and pear tart was a sweet finish to our perfect little meal. So what’s an agriturismo anyway? In Italy, it is a farm that is open to guests to experience the slower, rural lifestyle of Italy. Agriturismi (plural of agriturismo) usually serve food to guests prepared from raw materials produced on the farm, often have at least one room where guests can stay, and many have relaxing pools. And no, they won’t put you to work gathering eggs for your breakfast. The most work you’ll do while staying at an agriturismo is deciding which book to read while lounging poolside. San Gimignano does not have a train station and is really best visited by car. Renting a car in Italy is quite easy and it’s our favorite way to get around. 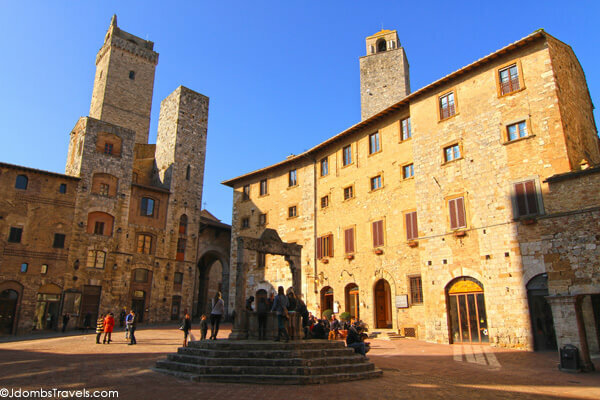 But if the Italian driving experience is a little too adventurous for you, you can get to San Gimignano by bus in around 1 hour 30 minutes from Florence. The BusItalia Nord (formerly SITA) bus company departs from the Santa Maria Novella bus depot and takes you to Poggibonsi. From there you catch the local bus to San Gimignano. Who doesn’t want to stay in an actual castle? Located about 30 minutes from San Gimignano in the village of Strove, we enjoyed looking out from our Castel Bigozzi tower window over the rolling hills and vineyards, getting up for morning runs through the vineyards and just relaxing in the Tuscan countryside. The castle has a pool, free wifi, and breakfast is included. It is even dog friendly. This article contains affiliate links. When you book on Booking.com through our affiliate sites, we earn a small commission at no additional cost to you. I love Agriturismo! The food, the people, the concept, did I mention the food? :). I’ll have to add this place to my list. The food is amazing! We will definitely be eating at agriturismi more often. I really don’t know why it took us so long to visit our first one! Mmmm – love wild boar! Wild boar is definitely delicious in any form! San Gimignano seems absolutely stunning. These pictures speak for themselves. I like the idea of cooling off with gelato. The name of the shop Mela House is interesting. Mela in Hindi means crowds, maybe there is some sort of similarity. I think so, Shalu! One tip I should have included in hindsight is to visit San Gimignano in the morning because the afternoon brought hoards of tourists on tour buses. It would have quickly become crowded. Eat gelato is one of the best things to do anywhere in Italy! This looks gorgeous, but then I think I’d struggle to find a part of Italy that isn’t beautiful. Audrey Hepburn should have said “Gelato is always a good idea!” Italy is indeed beautiful and we hope to be back to San Gimignano to explore the wine road when the wineries are open. They close up from November – April! I recently returned from San Gimignano, a fantastic place, unique. There are beautiful landscapes and the historic center is very nice and the people are very friendly. I stayed at the Raccianello farmhouse, I recommend going there, a very nice place to relax and enjoy the holiday. Just wanted to say thank you so much for this amazing article. Just came back from a day in San Gimignano and all your recommendations were fantastic. Particularly loved the gelato and gorgeous restaurant you recommended for dinner! 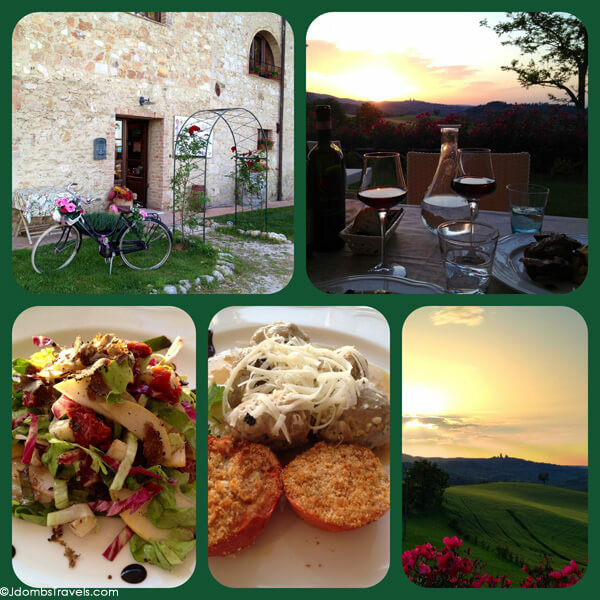 So glad to hear you enjoyed your trip to San Gimignano and that you liked our recommendations! I prefer to stay at agriturismos when we vacation in Italy. I LOVE them!!! We stayed at an awesome one in Tuscany, just north of Siena. Then ate at two other ones on Chianti. The food is always good ans I love the intimate setting. The people are nice and the surrounding farm is so peaceful. The owners are so proud of their place and love to converse with you and show you around. I never book hotels in Italy anymore!! You are right Kristin, the owners are very proud of their place and their enthusiasm to have you there can really make the experience. Jennifer, the agriturismo you recommend sounds lovely. We are 2 seniors. I have heard so much about San G and I have been to Italy 3 times, but never there so this time, it will be a day trip. Can we go there for a late lunch? We will take the bus from Florence to Poggibonsi and switch. I hope the info I have is good. From the bus terminal in San G, is it easy to get around to the places you suggest – for leather and gelato, especially – and how do we get to that place? Do we need a taxi? Also, I have planned my itinerary, and from Rome, I chose a night in Perugia at the Chocolate hotel. It sounds so cool. My dad used to travel to Italy for his work and always brought me Baci Perugia chocolates. This is before a few days in Firenze with day trips to San G, Pisa, and my favorite place Siena, and a couple in Cinque Terre, and a couple more in Venice. Meal times in Italy are extremely rigid with lunch from 12 – 2pm and then opening again for dinner at 7/7:30pm. So as far as a late lunch, no as you really need to arrive by 1:30pm at the very latest in order to be served. San Gimignano itself is mostly car-free and very compact. The gelato and leather shops are all right in the main square. You’ll just walk around the town. Also depending on when you are visiting, know that chocolate is not made or sold from April through October in Italy. It’s simply too hot and it would melt, so it’s just not sold.